We have teamed up with Marshal Papworth in our mission to deliver sustainable farming techniques to communities in sub-Saharan Africa. Marshal Papworth helps students from developing countries to grow themselves out of hunger so that they and their fellow countrymen benefit from a more sustainable future. 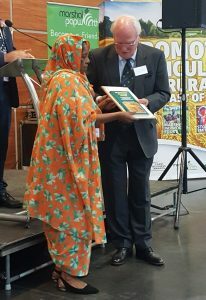 This is done through the provision of agricultural and horticultural scholarships and helping students to develop practical skills and valuable knowledge to share within their local communities in order to meet future food needs for generations to come. We identify appropriate individuals from across the developing world who are most suited to take part in the Marshal Papworth 10-week Short Course so that the information is disseminated in the most effective way. For more information visit http://www.marshalpapworth.com. Tahani Alphaki was awarded a Marshal Papworth scholarship for a 10-week agricultural short course at Moulton College in the UK in 2017. Tahani is from Port Sudan, in the Red Sea State of Sudan, and works for the Ministry of Agriculture. She attended this course with other students who came from various countries across Africa; the course was tailored to their needs and included lectures on bee-keeping, milk production, and livestock husbandry. Tahani says that the course has benefited her work a lot; since she returned from the UK in July, she’s given training to her colleagues and local male and female technicians, farmers, horticulturalists and children (as part of a schools farming project). She has shared the knowledge of what she learned at Moulton College and is putting into practice some of the techniques with local communities. We are looking forward to partnering with Marshal Papworth again in the future and supporting more students from Sudan, Ethiopia or South Sudan to experience this great opportunity.